As Bitdefender’s Clueful app demonstrated, not all apps that use the iPhone or iPad’s built-in Locations Services API ask permission. Even for the ones that do, sometimes we forget. Meanwhile the pesky apps make calls to the GPS, draining your precious battery life. While iOS 6 seems to be ramping up the privacy and security options available to the end user, it would be great to know which apps are really powering up the GPS in the background. 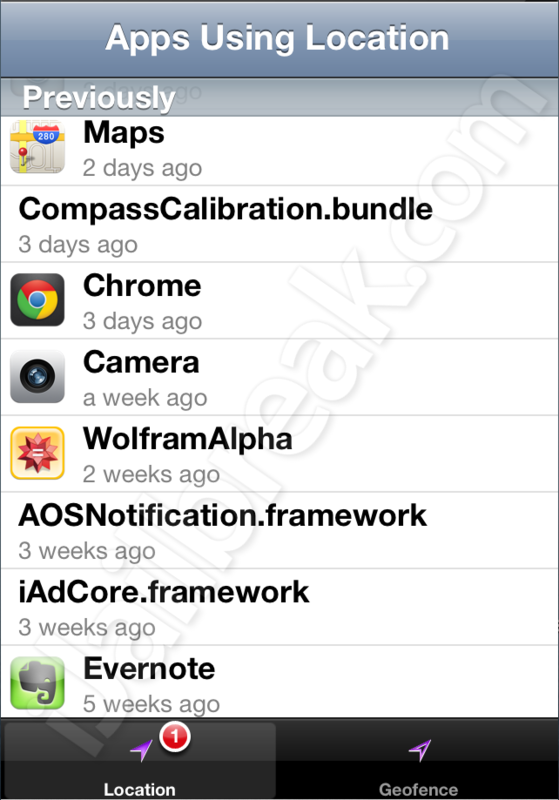 Apps Using Location is a Cydia app that lists all the apps (and bundles) that have been accessing Location Services, in reverse-chronological order. There’s also a section for apps which are currently using the service, as well as a section for apps which have set up a geofence. This seems to use Apple’s own logs for the data, as I have apps displayed that I haven’t used in months, let alone since I first installed Apps Using Location. You can use Apps Using Location to find problem apps, change their settings, or uninstall them and find alternatives. Tapping on listed apps launches them, but doesn’t seem to have any effect on .framework or .bundle files. This is handy when the setting is within the app, but it rarely is. It would have been even better if Apps Using Location also directly included toggles for allowing or disallowing each service. I didn’t find any apps that were terribly unexpected, though I was surprised to see how long back Apple’s logs went. Apps Using Location is a free app, though it is supported by a fairly non-intrusive banner ad. You can find Apps Using Location in the BigBoss repository on Cydia. It’s a shame that Apple removed Clueful from the iTunes App Store, but Apps Using Location does a small piece of Clueful‘s work. What other security monitors woul you like to see for iOS? Share your thoughts in the comments section below.